Physical activity is essential to staying healthy, and every small step can lead to big improvements. 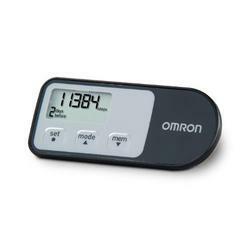 An accurate Omron Pedometer, like the HJ-321, is a partner that motivates you to take those extra steps toward better health and increased energy. Just wear it on your hip or place it in your bag or pocket. It accurately counts every step, using Omron’s renowned accelerometer technology. The HJ-321 Pedometer is specially designed for power walking and aerobic exercise. It counts your aerobic steps separately from normal walking steps, as well as the distance, calories burned and time you’ve traveled, giving you more information about your overall activity level.